First comes the pre-session phase. The countdown at the top right starts immediately for a maximum time length of 120 seconds. 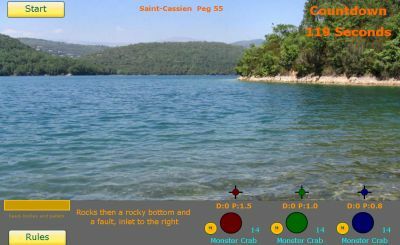 This phase serves to prepare your session: exploring your peg, choosing the bait, starting ground baiting and casting the fishing lines. If you are ready to start the session before the end of the countdown, you can end the pre-session stage by pressing the "Start" button. 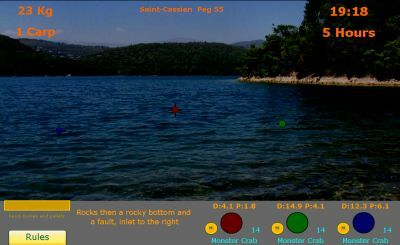 The fishing session starts for 8 minutes which simulates 48 hours of fishing. The timer is displayed at the top right and increases by increments of 6 minutes. Your aim is to catch as great a weight of carp as possible. You need to find the fish, therefore, and entice the shoals to come and try your bait. When a carp takes your line, it constitutes a bite. The led corresponding to the bite indicator and the line guide light up at the same time as the detector buzzer sounds. You strike by clicking on the lighted Led. But you have to be skilful because carp are crafty! When a successful strike has been made you switch into fighting mode with the carp. Only the active line remains and the spool appears at the bottom right with its brake and at the bottom in the centre, the line tension gage. 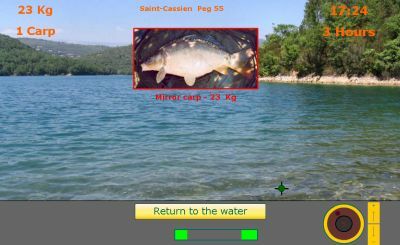 You reel the carp in to the bank by clicking on the mouse, the cursor changing into a reel. But don't forget to keep an eye on your line tension otherwise it might break or the carp unhook itself. Once the carp has been landed, you can then check the details of the fish which are displayed. CarpCup advocates a policy of "No-Kill". To return the fish to the water, click on the button "Return to the water". At the end of 48 hours, the session automatically finishes. The post-session calculations phase starts for a maximum of 60 seconds. 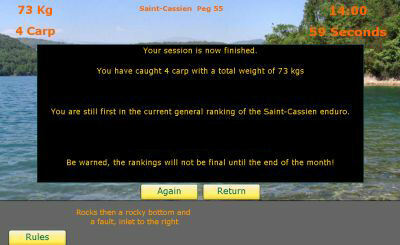 CarpCup displays the result of your fishing session and your ranking if you are in the Top100. You can immediately try a new session at the same peg by pressing the "Again" button. Otherwise, click on the "Return" button.